Published: April 13, 2018 at 05:35 p.m. Updated: April 13, 2018 at 05:48 p.m. Cutting Dez Bryant is the type of move the Dallas Cowboys have rarely made under owner Jerry Jones. The team has said goodbye to many franchise legends over the years, but those usually came a year or two late. Football has been the family business for Jones and his brood over the last 29 years, with a marked recent trend toward treating the Cowboys more like a business and treating their players less like family. The rising influence of COO/Executive VP/Director of Player Personnel Stephen Jones, Jerry's son, could be the driving influence behind the shift in Big D. Instead of holding on to star players or handing out rich extensions to the wrong homegrown players, the Cowboys are being run more like the other 31 NFL teams. Releasing Bryant is a prime example and absolutely the right move for the franchise. A clue to the current state of the Cowboys can be found in Jerry Jones' statement on Bryant's release. "We arrived at this crossroad collectively with input from several voices within the organization. Ultimately we determined it was time to go in a new direction," Jones wrote. Even Bryant called those "key words" in one of the many fascinating tweets that he's sent out since the news. NFL Network Insider Ian Rapoport reports that Jerry Jones was essentially the last man defending Bryant's place on the roster, whereas Stephen Jones and possibly coaches were in favor of a change. Bryant retweeted some speculation from a former teammate that Bryant's willingness to call out his coaches publicly was a factor. This wasn't just about the money. While Bryant's $12.5 million salary became an albatross for the organization, his level of play was the bigger issue. Bryant was not treated like a true No. 1 receiver by opposing defenses last season. He often saw single coverage and he struggled to gain separation in those matchups. His trademark ability to make contested catches was also diminished and there are concerns that his body is breaking down at age 29. He had multiple foot surgeries in 2015-2016 and has struggled with a recurring back issue. Unlike some veterans such as Anquan Boldin and Steve Smith who had terrific second acts as receivers, Bryant does not have the refined route running skills to naturally segue into the next phase of his career. The Cowboys made a clear statement they didn't believe Bryant would remain productive because it's not like they have great options at wide receiver. After the free agent wide receiver market proved to be too expensive for the Cowboys to pick up Sammy Watkins or Allen Robinson, Dallas' depth chart at the position looks meager: Allen Hurns, Terrance Williams, Cole Beasley, Ryan Switzer and Deonte Thompson. Bryant will cost $8 million in dead money on the salary cap this year just to get him off the books moving forward. If this was any other franchise, Bryant's release would be big news but hardly controversial. He hasn't topped 850 yards in a season since 2014, which was the year before the Cowboys handed him a five-year, $70 million contract extension. 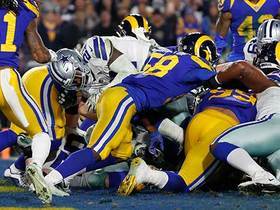 That deal was rightly celebrated as Dez's coronation among Cowboys royalty, the culmination of a sometimes-rocky stay in Dallas where he led the team with unmatched competitiveness. It would also prove to be the beginning of the end for Bryant, the type of contract that Jones regularly handed out to players far less worthy earlier in his Cowboys tenure. Going back to contracts for Terrell Owens, Ken Hamlin, Roy Williams, Miles Austin, Jay Ratliff and Anthony Spencer, the Cowboys had a habit of struggling to self-scout. It was as if Jones sometimes bought into the super-sized Cowboys hype created about his players and paid them accordingly. The last few years have seen fewer regrettable contracts like this and far greater salary cap fiscal responsibility. 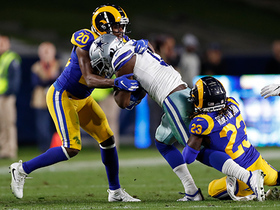 Cutting Bryant now rather than next season should help the Cowboys redirect that money into younger, worthier candidates for extensions like defensive end Demarcus Lawrence or guard Zack Martin. The odd timing of the move, coming fewer than two weeks before the draft, perhaps shows the last vestige of the old, sentimental way of doing business in Dallas. It appears that Jerry Jones couldn't bear to cut Bryant, ironically hurting the receiver's chances of maximizing his money by holding on to him into April. Bryant was clearly not pleased with the timing of the release and it's hard to blame him. 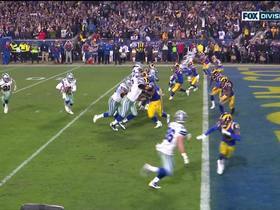 That should only further fuel his desire to stick it to the Cowboys, a revenge angle that Bryant is already gleefully playing up, saying "it's personal." Don't count out Bryant getting the final word, at least in the 2018 season. He was miscast as a face of the franchise and No. 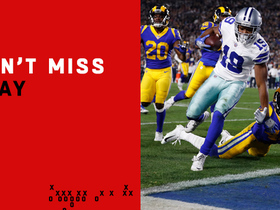 1 receiver in Dallas, but he can help out a contending team as a role player who can provide a boost in the red zone. This will be a new phase of Bryant's career and it points to a different era in Dallas. This is Dak Prescott and Ezekiel Elliott's offense now and Stephen Jones' influence in the organization is only going to grow. Twenty-nine years after Jerry Jones started his tenure as owner with an unsentimental firing of franchise legend Tom Landry, the Cowboys showed Friday that they'll no longer be afraid to say a tough goodbye.